Kellyanne Conway: We Didn't Need Wikileaks To Convince America That Hillary Is Unlikeable [VIDEO] - Joe.My.God. Incoming White House counselor Kellyanne Conway said President-elect Donald Trump’s campaign did not need WikiLeaks to convince Americans they Hillary Clinton was an unlikable candidate. “We didn’t need WikiLeaks to convince the American people that they didn’t like her, didn’t trust her, didn’t find her to be honest,” Conway told CNN’s “State of the Union” on Sunday. 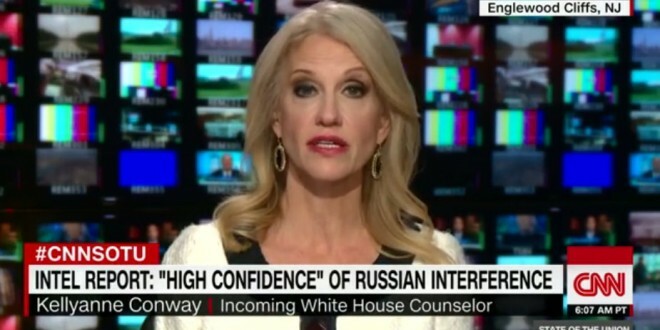 Conway maintained that Russia’s attempt to meddle in the United States election failed. “The alleged attacks, alleged aspirations to interfere with our democracy failed,” she said. WikiLeaks published stolen emails from Clinton’s campaign chairman, John Podesta, and the Democratic National Committee. Its founder, Julian Assange, has said Russia was not the source of those emails.